“So when you give to the poor, do not sound a trumpet before you, as the hypocrites (i.e. the Pharisees) do in the synagogues and in the streets, so that they may be honored by men. Truly I say to you, they have their reward in full. At the same time – out of greed – they were taking advantage of the most vulnerable people (“devour widows houses”) who could not resist the evil being done to them. The listeners needed to be wary of these narcissists not only because of the potential harm they could do through their greedy actions, but also (and even more importantly) because of the terrible example of “faith” which these narcissists were setting. Instead of humbling themselves before the God of the universe, and praying secretly, they were putting on a show for only the exaltation which they would receive at the hands of men. Following this supposed spiritual leadership of the scribes would be the opposite of a genuine life of the kind of faith pleasing to God, and spiritually dangerous to any who would follow. Hence Jesus’ warning to “beware”. While Jesus did not call out these scribes by name, He did something even better by providing a guideline by which His listeners could recognize these people and others like them – and to prudently be on guard against them and their destructively prideful and self-seeking ways. Please see Putting “Biblical Perspectives On Narcissism” Into Perspective for an overview of this blog. 39 And Jesus said, “For judgment I came into this world, so that those who do not see may see, and that those who see may become blind.” 40 Those of the Pharisees who were with Him heard these things and said to Him, “We are not blind too, are we?” 41 Jesus said to them, “If you were blind, you would have no sin; but since you say, ‘We see,’ your sin remains. One of the primary traits of the narcissistic Pharisees was their attitude of moral superiority and refusal to acknowledge that they had any sin – even though their inward lives were full of sin. In this they deceived and lied to both themselves and others. This can also be seen in Luke 18:9-14, Matthew 23:25-28, and Matthew 9:10-13. M Scott Peck was a psychiatrist whose personal journey ultimately led him to commit to Christianity. By observation and analysis, through the lens of Christianity, he reached the same conclusion that Jesus had already made clear above. Woe to you, scribes and Pharisees, hypocrites! For you tithe mint and dill and cummin [see note], and have neglected the weightier provisions of the law: justice and mercy and faithfulness; but these are the things you should have done without neglecting the others. 24 You blind guides, who strain out a gnat and swallow a camel! 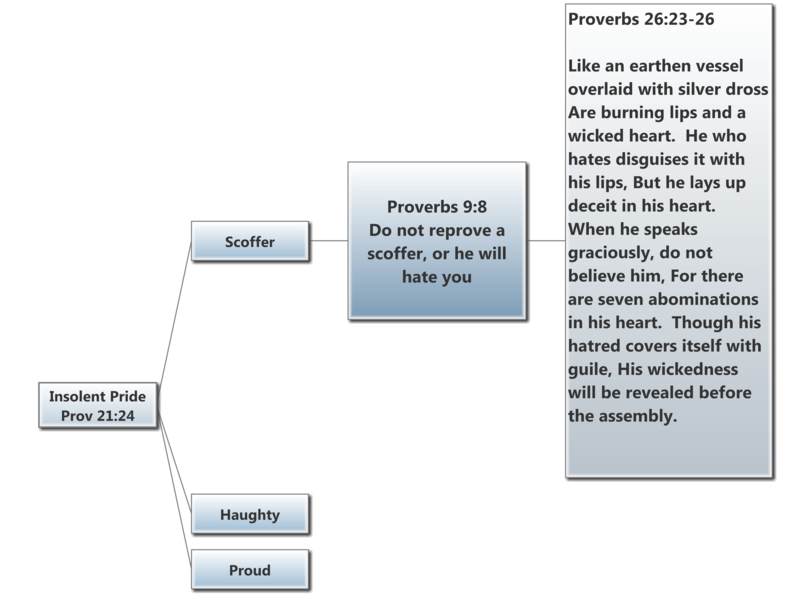 The bottom line is that God HATES insolent pride. It results in much harm to others, and is the single biggest barrier to the prideful person experiencing His true love and goodness.